Trevor Mallard giving David Garrett advice is like Oprah Winfrey giving guidance to Kirsty Alley. As at 31 July, there were 55,272, working aged people (18-64) receiving the unemployment benefit. Overall unemployment benefit numbers are up by 34,726 (169%) since July 2008. Up from 50,855 at June 30, 2009. That's difficult for National who have been insisting that Labour's claim of 1,000 people a week losing their jobs is an exaggeration. Of course some of the new unemployed beneficiaries will be people returning from overseas or even dropping out of education. It would be interesting to know how the other sometimes pseudo-unemployment benefits are bearing up. It is all about free speech apparently. I am very much for free speech. What I am not for is free lies, or free half-truths. If the Minister had released information that did not pertain directly and only to that already released by the protester I would also be up in arms. 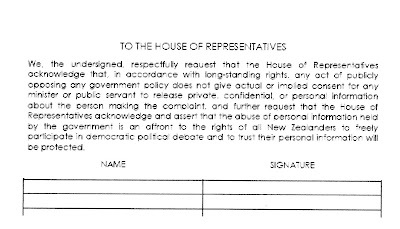 As it stands there is already enough legislated protection of privacy so I do not feel a need to add my signature. The latest household labour force survey, published yesterday, confirms young people are bearing the brunt of the downturn, with a net 23,400 teenagers losing their jobs in the past year. This claim is spurious. But it makes for good copy. Unfortunately thousands of people will read it and believe it. How does it come about. First of all the government, through Statistics New Zealand, conducts what they call a Household Labour force Survey every three months. There are 16,000 households on it at any given time but it is a changing group as new participants are rostered on and old rostered off. Each participant spends 2 years in the survey (I have been a participant).The information is gathered and extrapolated across the population. The tables produced breakdown the employment data gleaned in various ways. 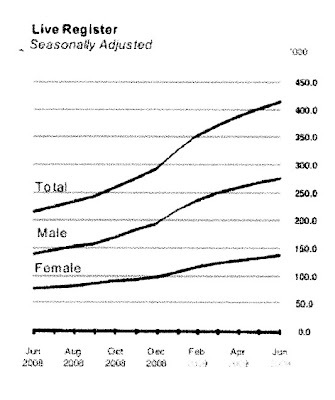 In June 2008 146,900 15-19 year-olds were employed. In June 2009 the number had dropped to 123,500. The difference is 23,400. At June 2008 the majority of employed teenagers would have been 19. By June 2009 they would no longer be teenagers. They didn't lose their jobs. They stopped being teenagers. Yes, there are certainly more unemployed teenagers than there were a year ago - 9,800 according to the survey because employers are not taking on young people to the degree that they had been. Two-thirds of the 18,200 lost jobs in the past year were in retailing and wholesaling, with the next biggest losses in farming, forestry and fishing, transport, storage and communications, and manufacturing. Now the 'lost jobs' are less than the numbers who apparently 'losing their jobs'. A massive 43,000 people under 50 lost their jobs, but there was a net gain of 24,400 jobs for people aged 50-plus. Again, 43,000 people under 50 did not lose their jobs. We don't know how many people lost their jobs. If there is a 'net' gain to older age groups there is a strong possibility some of the difference is due to people ageing and holding their jobs. In June 2008 there were 2,189,000 people employed - in June 2009 there were 2,169,000. Therefore there were 20,000 fewer employed people - based on a household survey. That's all that can be said with absolute certainty. If Paula Bennett is releasing benefit data today, that will tell us more about how many people 'lost their jobs'. But that information is still not definitive given many people losing jobs are not entitled to a benefit. As the saying goes, there is always someone worse off than yourself. The same can be said of countries. Look at Ireland. Same population as NZ with current (June 2009) unemployment at 11.9 percent. Last year is was 5.9 percent. Doubled in 12 months. Gulp. Only Turkey and Spain have higher unemployment rates. This table shows unemployment benefit claimants. Unemployment statistics - who is the recession affecting? At last. A clear explanation of the unclear. Jim Evans, emeritus professor of law at Auckland University, on the National-supported Bradford law. This is not clear legislation. In creating this law, Parliament abandoned its constitutional responsibility to say with clarity just which conduct is criminal. The section results from a political fudge. Whatever other views one takes about the topic of smacking, that much at least ought to be kept clear. There are times when my fellow citizens fill me with despair, such is their blind faith in regulation. Should you need a licence to own a dog? FFS NO. What difference would it make to those who 'own' dangerous animals? If they don't register them why would they bother with a licence? The only effect would be to penalise the many animal lovers who take better care of their pets than some people take of their children. Update; The poll has mercifully reversed. The 'baas' now form a minority. That is encouraging. Yesterday the DomPost published misinformation about benefit entitlement. Now the NZ Herald is getting it wrong as well. The main unemployment benefit is not available under 18. The only benefit payable below that age, the independent youth benefit (IYB), was paid to only 1750 teenagers at the end of June. As I said yesterday, the unemployment benefit is available but only under certain, unusual circumstances. For most intents and purposes it isn't available. But to say that the Independent Youth Benefit is the only benefit payable below 18 is nonsense. Sickness, invalid, training, emergency and DPB (Emergency Maintenance Allowance) are all available. So too is the student allowance. Remember yesterday's table? Should 16 and 17 year-olds qualify for welfare? The approach to parental responsibility is mixed. For instance child support is paid until a dependent reaches 18 ( and in some cases 19). Then when it comes to eligibility for a student allowance parental income is means tested until the age of 24. National needs to bite the bullet on this one and stop dithering. Sixteen and seventeen year-olds should be the responsibility of their parents. As it is, they attract decent family tax credits of up to around $100. Dole for 16-18 year-olds to be scrapped? This morning's DomPost front page shouts, Dole to be scrapped for 16-18 year-olds. Before the release of details I offer some comments. The signal is good. For those who need to be receiving it. But I think the headline is wrong. It should read 16-17 year-olds. [Key] also confirmed National would introduce legislation before the end of the year ending the unemployment benefit for school-leavers under 18. But under 18s rarely qualify for the unemployment benefit. The current rules are a person must be 18 years old or over (or 16-17 if you are married or in a civil union or in a de facto relationship and have one or more children you support). Granted this was two years ago but I would be very surprised if suddenly far more 16-17 year-olds had married, or were in de facto relationships supporting children. 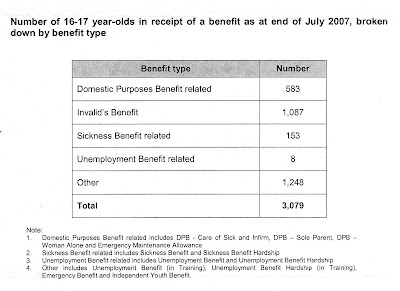 The benefit 16-17 year-olds normally qualify for when unemployed is the Independent Youth Benefit (1,430 at the end of March 2009 but down from almost 4,000 in 2000). Is this being scrapped? If so, yet the Emergency Maintenance Allowance for 16-17 year-old single mothers remains, isn't there an incentive being set up for young people to become parents to continue to get assistance? Call me cynical but when eligibility rules change the first thing some will do is look for the loophole, the way around the hurdle, because one usually exists. Job Ops and Community Max. Flash new names for government work creation schemes just announced by John Key. First consideration must be given to the opportunity cost of taking the tax to fund these schemes. Better if the money is left with the private potential employer in the first place. It's pretty illogical to tax the employer and then turnaround and say, if we give it back, could you provide a job? However the reality is the scheme is going ahead. I agree with the central idea that if money is going to be chucked at young people, best get a return for it. Best make it an 'investment' in them for all our sakes. But one has to assume that money is still going to be chucked for no return because no mention has been made of restricting access to the dole, sickness benefit, dpb, ema or independent youth allowance. No mention of sanctions if young people refuse a placement. Maybe that is to come but I am not holding my breath. Are you? Finally there is nothing new under the sun with these sorts of schemes. In the final analysis what they actually achieve is a distortion of the labour market. There are no free lunches and there are no free jobs. Other potential employees unfortunate enough to be older than 24 will be disadvantaged by not attracting a subsidy. They are most likely to be low-skilled Pacific, Maori, and migrants.